In my previous post, I have talked about, positive thinking can help us to create our happiness and to create a positive thinking, it’s just a matter of creating a new habit. Obviously, not everyone can stay positive and happy all the time, it’s quite normal sometimes to feel angry, sad, worried etc. These are all negative emotions that we can not avoid but what we can do about it is not to dwell on these negative emotions. We need to keep in mind that nothing change for the better if we are worried, angry, sad, it ruins only our present state of mind. Let’s say we are worried about something, obviously, we are worried about some issues that have still to come, they belong to the future, could be an exam, could be a meeting, could be worries about money, health, anything really. Now if we spend all our time thinking about it and just worrying, is it going to make us feel any better? I don’t think so. Worrying is a negative natural emotion created by negative thoughts. When we are worried, we tend to think about “what if things go wrong”, we can also visualize funny and not pleasant situations because we are worried about the outcome of something. I have never heard anyone say that worrying makes you feel good… because we well know that it doesn’t. Is worrying then going to help us to have a positive outcome? Again I don’t think so. As I said above, worrying ruins only our present, but not only, it makes us even weaker because having constant worries buzzing in our mind can be very tiring and doesn’t allow us to think straight. When we are worried, we are like in a pilot mood, we are not really aware what is happening around us because we focus our attention on those thoughts all the time. It is the same thing even when we are angry at someone or a situation. It’s normal to get angry but it’s not good at all to spend a lot of the time being angry. Control you Anger, it’s only a letter away from “d”Anger. You might like reading: How to control our Anger. Anger is an emotion associated with a thought about something that happened in the past. We need to let it go, it belongs to the past, to be happy we need to live the present. Anger comes from the past, worrying is about the future. The past is gone, the future is yet to come, let’s live the present. Remember: Happiness is in the present moment, the only moment we are alive. Life is full of habits, not only excellence can be a habit, but also happiness, sadness, everything we keep doing become a habit. The more time we spend on a mental state, it’s very easy for it to become a habit, so we want to be sure we create a good habit of positive thinking. Sometimes it might not be so easy to be positive, especially when things go wrong and we are stuck with some negative thoughts that are buzzing in our mind. Even a little problem can make us end up in a negative state, have you noticed that a thought attracts another thought, it’s like a chain, a bit like the domino effect continues. A positive thought attracts a positive thought, and a negative thought attracts a negative thought. Have you ever had one of that day where starting from the beginning it all went wrong? It has happened to me in the past and, to be honest, it was quite frustrating. What we need to do is break the chain of negative thoughts and start a new chain of positive thoughts. 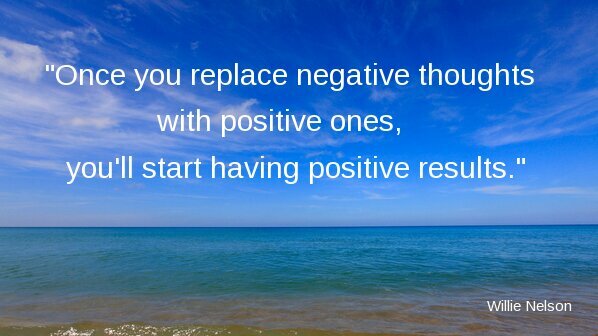 How can we replace our negative thoughts with positive thoughts, changing our mental state from negative to positive? How can we change and go back to be positive when we are angry, worried, sad or in any other negative mental state? Basically, we need to focus our attention on something else, something good, positive. Whatever we focus on, we create thoughts. To move our attention and focus, we can use some affirmative cues, which is something I learned during an online course that I took years ago. I also like to call them “mood savers ” because they save a person from dwelling in a negative mood. These affirmative cues or mood savers are basically mnemonic devices for our mind. There are two types of affirmative cues: a type that is based on memory and another type that is based on an activity performed. Let’s start with the affirmative cues that rely on our memory. We need to sit down, relax, and concentrate on our breath, breath calmly, imaging the air entering through our nose and feeling the air inside our body for 3o sec to a minute. Then to create a cue so memory-based, we need to recall a particular memory of our life associated with a moment of happiness. Take your time to decide which memory you are going to choose. The memory can be from any period of time in our life. It can be a memory of a parent who was spending time with us. It can be a memory of a time when we met someone special and we felt happy. We may also use a memory of a big achievement we had. It must be a really good happy memory for us. We felt good and happy when we lived that moment. Now we need to close our eyes and focus on that particular memory. We need to start building and visualizing the scene, where we were at that time. Like in a movie, we need to play the scene back in our mind, like we were there. We need to try to remember how we were dressed, the weather or the season, who was with us, the environment around us, the people that were with us, try to remember importantly how we felt at that moment and try to recreate that feeling. We need to embrace the warm feeling of happiness and live it again in our mind. Done it? Congratulations! You’ve just successfully created your first affirmative cue, based on memory. 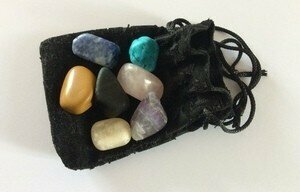 What I personally do when I want to create an affirmative cue, I keep in one hand my 7 Chakra little stones because I want to associate that feeling of that memory with my stones. It works like a switch. To turn the light on we need to press the switch if I want to empower my positive state or change my negative state, I take out of my pocket my little pouch with my stones, I sit down, relax, I concentrate on my breath and I recall one of my affirmative cues. In that way, I manage to liberate my mind from negative thoughts, basically because I decide to think of something else and I focus my attention to something positive, that makes me feel good, happy. The more we practice, the easier we can change our mental state from negative to positive anytime we want. Remember it’s only a matter of habit. I remember I was talking to a dear friend of mine few years ago. She used to tell me, we have got remote controls for our Tv’s, music player and many other utilities, and she was saying, it would be nice to have a remote control for our mind, just press a bottom and we are in a different mental state, a different mood. Well, we all have a remote control inside, we need only to learn how to use it. We need to have made the choice to be happy, have a great desire and determination, the right positive attitude through our life and we need to take action every time is needed. Be happy is like having a candle inside us and we need to keep it alive. Negative things can turn off our candle, that’s why we need action from within us. Whenever we feel down, sad or in any other negative mental states created by our negative thoughts, we need to snap out from that mental state and using one affirmative cue could be one way to change our negative thoughts to positive thoughts. The second affirmative cue or moodsaver is based on an activity. Sometimes we can feel so bad, sad, down and our negative thoughts they are spiraling out of control in our mind that some affirmative cues might not be enough to change our thoughts to positive ones, so we need a stronger approach. We can use an affirmative cue based on an activity. We need an active intervention, something that would force our mind to look away from the negativity. We need to think of an activity that we really enjoy, that makes us feel good, such as singing, playing some sports, painting, dancing or even driving around town. Doesn’t matter the type of activity, what is important is that makes us feel good. If we feel good and enjoying it, we focus all our attention on doing it and so slowly our negative thoughts disappear, because we are concentrating on something else, we are replacing them with positive thoughts. Few years ago I was having a conversation with one of my friend’s mother. She was telling me how she was coping with the loss of her husband. What got stuck in my mind was that she said, when I feel more down than usual I start sewing, it’s my passion, it makes feel better. When I start sewing I forget everything and when I finish I feel much better. She had discovered a way to snap out from a negative mental state and she was using it all the time because it was working. Why it’s stronger than the previous cue based on memory? Because we force ourselves with an action to focus on something else, we distract ourselves from our negative thoughts so they become secondary, they lose power and stop buzzing in our mind. Then, once we have chosen the activity, what we need to do is, to take a mental note that every time we feel overwhelmed by problems and negativity we know what to do, we need to take action and focus our attention on something positive. To turn the lights on, we need to turn the switch on, don’t we? These can be “our switches” to turn on our positive thoughts. I personally like doing few different things to empower my positive state, one of them, for instance, is walking meditation, it helps me to feel grounded, live the present moment, feel alive and clear my mind from negativity. Now it’s your turn, think of that activity that makes you feel good or do you already have a way to replace your negative thoughts with positive thoughts? Feel free, either ways, to add your comment below. Thank you.